What is it: A puzzle-platformer for one or two players, which doubles as a video documentary about the Alaskan Iñupiaq tribe. Players control the girl Nuna and an Arctic fox, who must solve the riddle of an unrelenting blizzard. Remember when PC Gamer scored the Pyramids of Giza a solid 81%, praising the authentically weathered textures while docking points for repetitive encounter design? No, neither do I, and that's why I'm a little in awe of Never Alone. On one level the game is disarmingly straightforward: it's a side-scrolling puzzle-platformer with ICO-style partner mechanics for one or two players, where you guide a cherubic waif and her fox companion through a wilderness of bobbing, buckling ice floes, lowering forests and ramshackle stilt villages. On another, it's something quite special and, from a reviewer's perspective, intimidating. Working with the Cook Inlet Tribal Council, Upper One Games has assembled a marvellous tribute to the Iñupiaq tribespeople who reside in northern Alaska, in which videos about native customs are unlocked as you progress through the campaign's eight chapters. “Unlocking” is too bleak and unfeeling a word, though – what you're doing is reclaiming, rescuing the fragments of a way of life that's melting away into the ocean, in order to shore up the sense of fellowship that's boldly insisted upon by the game’s title. The result is beautiful, hopeful and sad. Scoring it feels rather presumptuous, like slapping “Must Buy!” on the cover of the diary of Anne Frank. To put the cherry on the cake, Never Alone is also a cautionary tale about climate change. Its plot draws on the Inupiaq folk legend of Kunuuksaayuka, in which a boy searches for the source of an endless blizzard. Some of the videos deal with the overlap between this and latter-day global warming directly, but the sharper display of political awareness is perhaps the problematising of hoary old genre devices, such as moving platforms—you can’t leap aboard a free-floating ice block, or flood a chamber in order to reach the one above, without thinking about the warming sea all around you. There’s an argument about materialism in play, too: Nuna is pursued through certain levels by a fireball-throwing, village-wrecking Manslayer, a folkloric representation of avarice, whose rapacity must ultimately be turned against him. The symbiotic rapport between the girl and the fox—which trots jauntily out of the artfully blurred, spectral backdrop just in time to save her from a hungry polar bear—is a crux for the narrative’s preoccupation with reconciliation between humankind and environment. It’s also the basis for some pleasing if gentle puzzles, where you switch between characters with Q key to use their complementary abilities in tandem (the offhand character follows your lead automatically, assuming there isn’t a co-op partner to hand). The fox is springy enough to scamper up surfaces and wall-jump, its claws skittering over the rock, while the girl is able to climb ropes and drag crates to serve as platforms or weigh down see-saw structures. The fox’s presence also attracts friendly spirits who resemble traditional Iñupiaq drawings, each sliding into focus as you approach like plankton under a microscope. These can be clambered on by Nuna, providing her furry accomplice is nearby—as you’d expect, more challenging puzzles ask you to maintain that proximity despite the level layout’s efforts to keep you apart. Some spirits are initially trapped inside gristly orbs of light that must be popped with the girl’s throwable bola, which can also be hurled at brittle ice formations and wood to clear the path. Later on, the fox gains the ability to call the creatures with a button press, a trick that allows it to move “platforms” manually. This crescendos in the spectacle of a dryad striding through the waves while Nuna clings to its branches, which untwist and stretch out towards ledges at the fox’s urging. 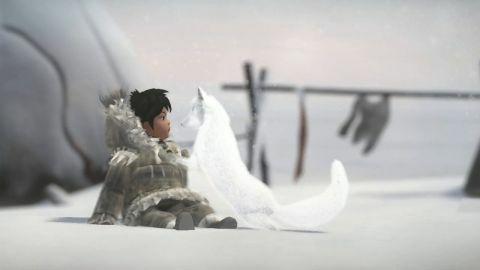 Never Alone’s healing of the rift between a world and its inhabitants via the functional relationship between two characters is perhaps its strongest quality. Sadly, this interplay also makes it harder to ignore the blemishes, such as the AI’s occasional decision to walk into hazards, or the times when you leap for a handhold and somehow don’t connect. The sorest spot of all is that spirits can only move in scripted ways, but exactly how isn’t obvious—leading to moments of frustration during chase sequences, as you struggle to decipher the game’s platforming logic. Another quibble is that the story can be completed in an evening or two, which means that the puzzles don’t have time to flower into conundrums as rich as those of, say, Dustforce. Still, to complain about length is to miss the point of a game that doesn’t just set out to entertain. Never Alone is a wonderful living record, articulated and at times hindered by the mechanisms of the platforming genre. It teaches that the preservation of history is its own reward, and proves that videogames have as much right to facilitate that process as any other artform.